One hour and a half away from Paris via the motorway “Autoroute de Normandie”, Seine-Maritime is an ideal place for weekend breaks and short breaks. The Department of Seine-Maritime has an extensive coastline facing the Channel (the Alabaster Coast) and is crossed by the river Seine. Plan your journey and itinerary for your stay! Daily crossings to the ports of Le Havre and Dieppe with DFDS Seaways. Car rentals, the train station or the bus station will allow you to go to your holiday cottage or B&B. Book your crossing with DFDS Seaways. 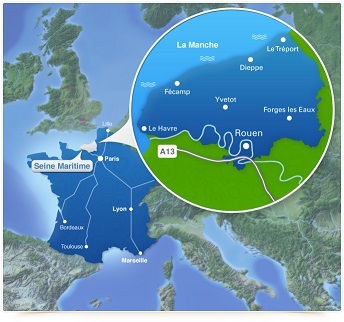 You will be able to travel around Seine-Maritime thanks to the French and European railway network. Book your train ticket with SNCF.